I have not written in a while because I have not been the in the mood. This happens from time to time. It’s odd because one moment there is much to write about and then the next I don’t feel like it and then it feels like a chore. My head spins. The weather is still on a rollercoaster of sorts. I am hoping this bout of cold nights will be coming to an end because I already moved the plants wintering in the cottage outside. The daytime temperatures are fine, but the evening temperatures have been dipping too low. During weekends I have managed to work on a few projects such as planting the apple trees into whiskey barrels, emptying the VegTrug and moving it over a couple of feet and relocating the raised bed that was behind the cottage near the VegTrug and other beds. The raised bed is going to be used for a small vegetable bed, but the vegetables will actually be planted in containers that will be put into the raised bed. The reason for this is the framing of the raised bed is made of pressure treated timber, which of course can leach chemicals into the soil and then your vegetables take up the chemicals. It’s not a good thing, however keeping the vegetables in containers should help prevent this from happening. In between the containers flowering plants will be planted to help with pollination. I am still waiting on the landscaper to show up. He was supposed to come in early March, but here we are in April and I still wait. It’s frustrating, but this seems to be the norm for landscapers. I hope it will be soon because I have quite a few plants to transplant to the new front beds when they are completed. I also have some new purchases that should be arriving soon that are for the front beds too. I intend to plant them into pots, so they can begin to grow and size up a bit before going into the ground. Moving the raised bed from behind the cottage has given me plenty of space to spread potted plants about while they wait to be moved to the front so all is good. ‘Jubilation’ Gardenia. 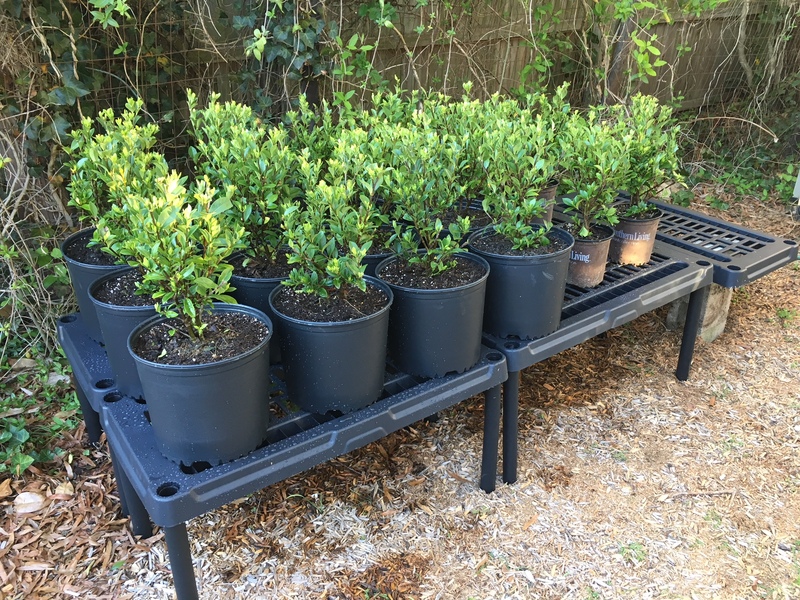 I ordered 16 of these for a hedge to go out front. A neighbour from across the street came by and helped me install the new fountain. 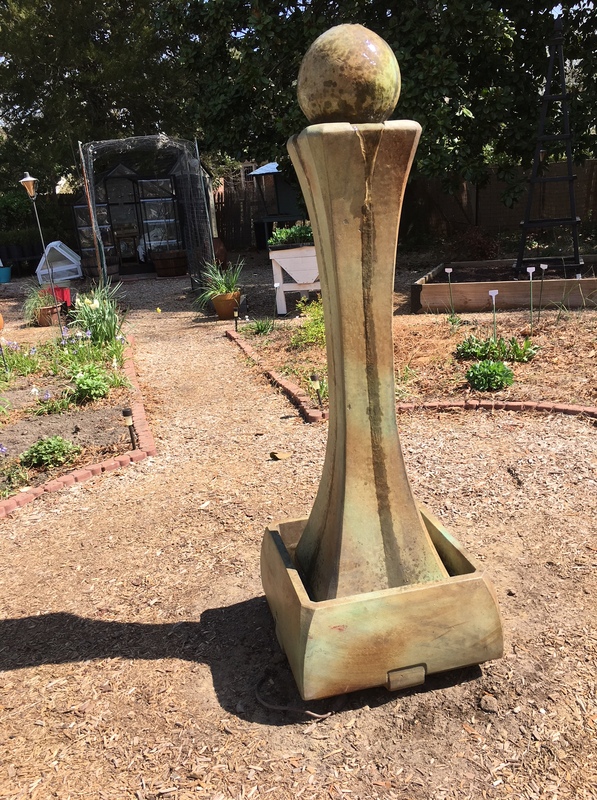 It was truly nice of him to offer to help because the fountain weighs 465 lbs. 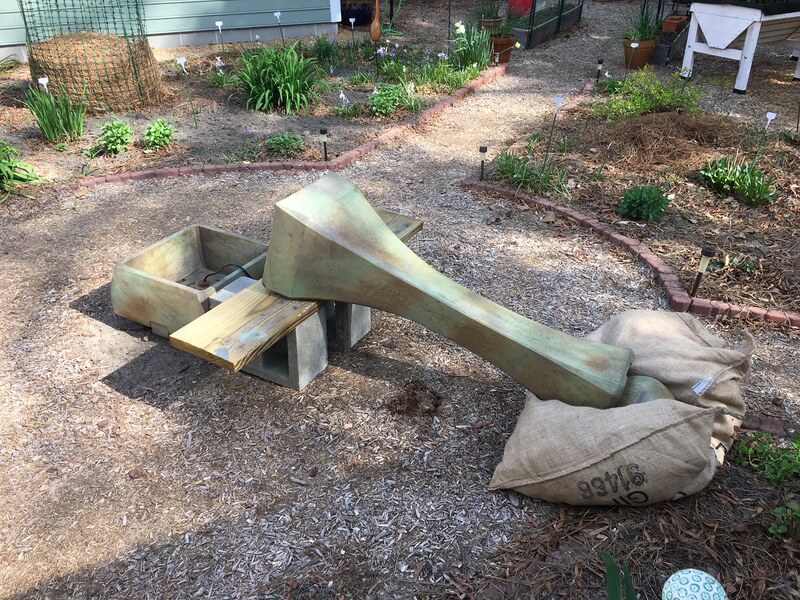 We had quite a time figuring how to get the main part of the fountain into the base, but we ended up laying it on its side and raising one end up on two breeze blocks with a board. Then we padded the inside of the base with burlap bags and then quickly lowered the main part of the fountain down into the base. It actually moved rather quickly due to gravity! Then the burlap bags were pulled out, the water added, and the pump turned on. The bedstead has been finished and has been moved into the house. I am happy with the outcome even though the teester did not come out right. I do plant on reworking this part sometime in the future. The good thing is I can take it down and work on it without taking the entire bed apart. The bedstead finished and moved into place. Honestly, the bed is too large for my room, but I gave my mother the master bedroom when she moved in, so this is what I have to work with. I consider it my room within a room! In other news, I had to purchase another car. The smart car was getting old and things were starting to go wrong and it was difficult to have worked on in the area I live. I could get the oil changed, but not much anything else. For anything else I would have to travel to Raleigh to a Mercedes dealership to have it worked on, which is an hour away and expensive. So, it was time to let it go. 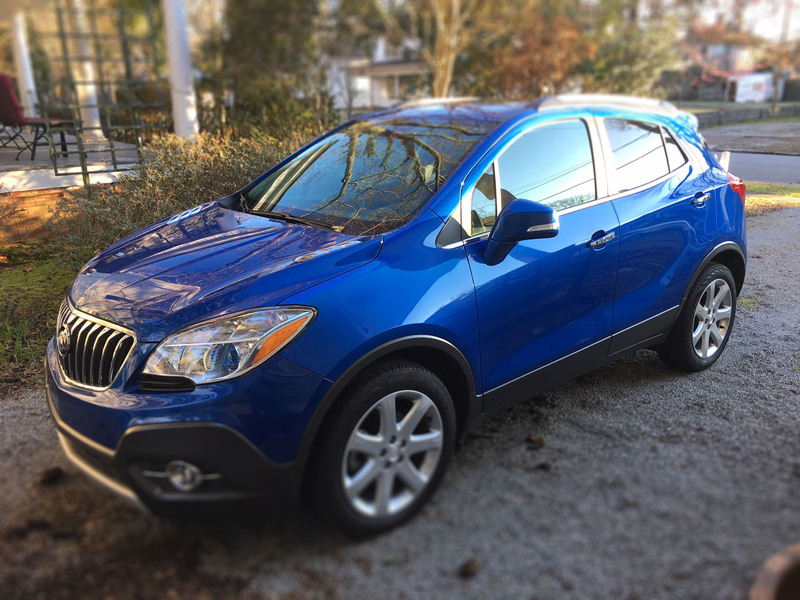 Since I turn 51 this year I figured it was time for a Buick and I went with the Encore. I was able to get it in the blue that I so love, and it is loaded with technology. In fact I am still trying to learn what all of it does! It is truly wonderful to drive and very comfortable. I am, however, not loving the car note, but such is life.